What fun would summer be without bubbles? It is the season of bubbles, and with the 4th of July coming soon, you may want to have some bubbles around for your parties and BBQ’s. Ideas for Homemade Wands could include: a wire hanger, a straw, a piece of string, or an old pair of sunglasses with the lens popped out. Be creative! If you are looking for a conversation starter, you can bring up these interesting facts about bubbles. 1. A Chicago company called Chemtoy began selling bubble solution in the 1940s. 2. Soap bubbles blown into air that is below a temperature of −15 C (5 F) will freeze when they touch a surface. 3. About 200 million bottles of bubbles are sold annually. 4. 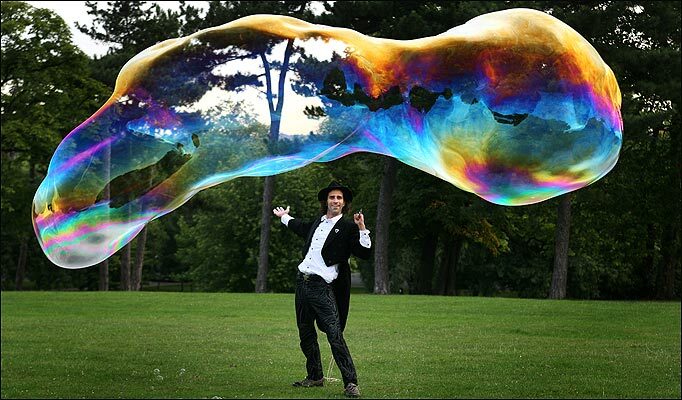 Largest Free-Floating Soap Bubble: On October 9, 2005, John Erck of XTREME Bubbles blew the Guinness World Record largest free-floating soap bubble, 105.4 cubic feet (2.98 cubic meters) in size. If the bubble were filled with water, it would hold 788 gallons and weigh 3.2 tons. To give you another idea of its size, 13,627 baseballs would fit inside of it. 5. Most Bubbles Blown with a Tarantula in the Mouth: The longest time blowing soap bubbles with a tarantula in the mouth is 1 minute 27 seconds and was achieved by Bruno Meggiolaro (Italy) on the set of Lo Show dei Record in Rome, Italy, on 25 February 2010. A second tarantula was walking over his body during the attempt. The record was part of the Italian TV show “Lo Show dei Record” See the record at The Guinness Book of World Records. For more information about Bubbles, you may wish to check out the sites listed below. 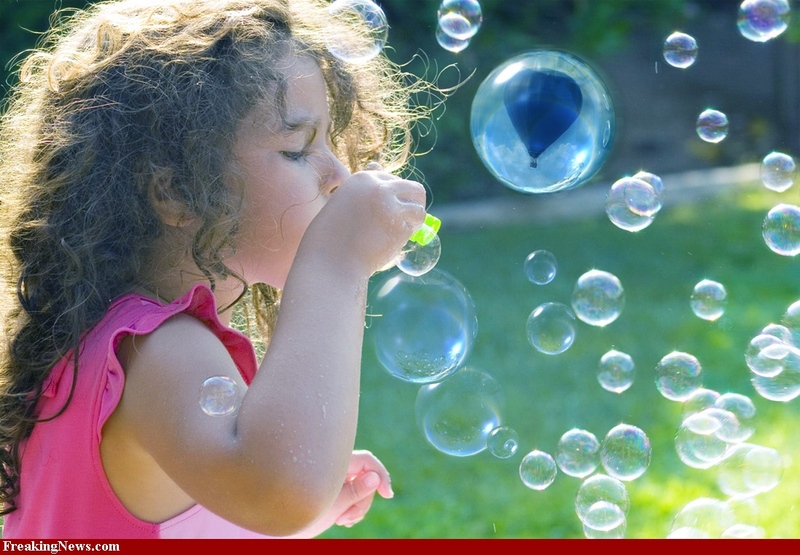 Posted in Helpful Hints on Everything and tagged 4th of July, BBQ's, Bubble Facts, Bubble=Summer, Bubbles, Celebrations, children, fun, Grandmother Musings, kids, make your own, memories, Parties, Picnics, postaday, recipe, soap, soap bubbles, summer, Water. Bookmark the permalink. Nice post with conversation starters about facts I didn’t know and would love to share. Love it. My two teen cousins still get crazy over bubbles. A few times a year I’ll buy a bottle or two and we’ll go in the back yard and see how big we can get the bubbles to grow. Either that or just try to make a million little bubbles all over the place. Can you see something in the bubbles? I can, and fantasize big. Any fantasy is good and that number might just appears. 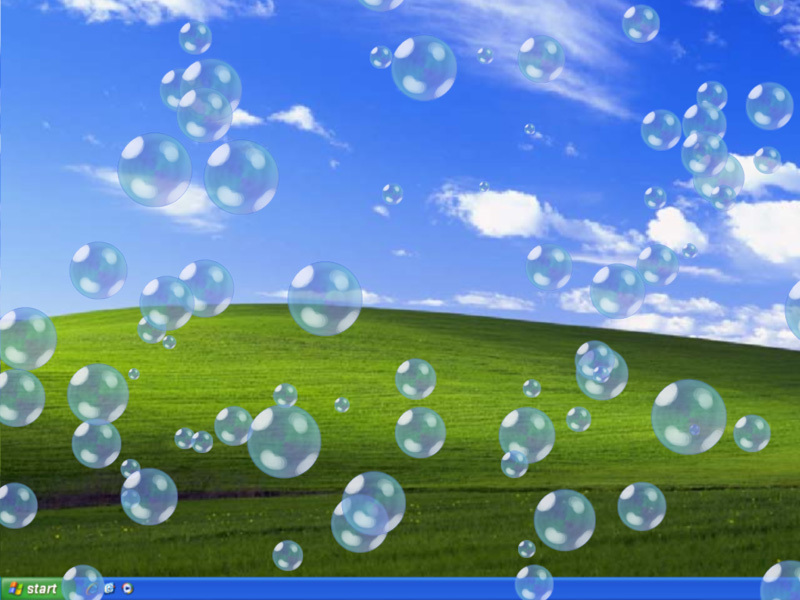 I have someone who has to do bubbles everyday! 🙂 She does them each night in the tub, after she’s washed up. We take little bubble containers in the car with us, and she does them out the window while waiting for me to run in the store. It is so funny, like you said, to see peoples expressions when they see big bubbles floating by! Thanks for all the cool bubble info! God bless you! What fun! I remember those bubble days. How did that hot air balloon get in there? Thank you for visiting my blog. I am sorry to say that the photo you are interested in is not mine. I found it at http://www.freakingnews.com You may wish to contact that web-site for permission to use the photo. I hope this helps. Enjoy the day.